India’s popular anti-corruption activist Anna Hazare on Thursday pulled out of plans to campaign against the ruling Congress party in key state elections due to poor health. Hazare, 74, who last year triggered a massive civil protest movement against India’s deep-rooted culture of corruption, had vowed to rally opposition to the Congress party in five states that go to the polls over the next three months. But he halted his hunger strike in Mumbai last week and has since been treated at a hospital in the neighbouring city of Pune for chest congestion and back pain. 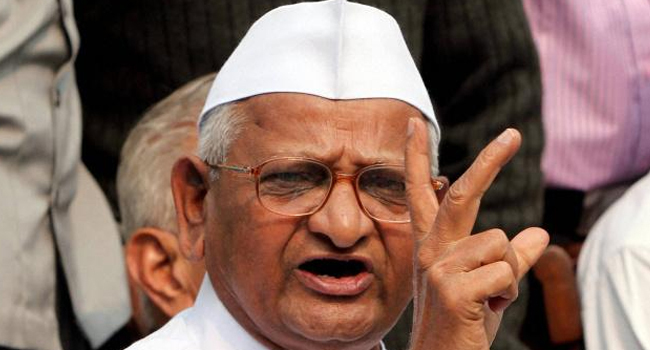 “Anna is still on medicines and he is on drip so he needs complete rest,” Kiran Bedi, a close aide of Hazare, told reporters. “Doctors are not allowing him any more fasts or exposure through travel and so he won’t be campaigning.” Hazare’s fast in Mumbai attracted far less public support than his 12-day hunger strike in New Delhi in August, which galvanised millions across the country, and many observers say his popularity has peaked.